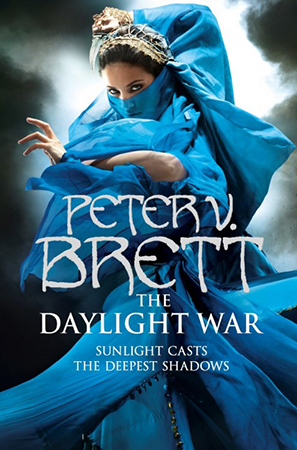 Peter V. Brett is the bestselling author of the hugely popular Demon Cycle series. His latest book The Daylight War was released in February by HarperVoyager in the UK and Del Rey in the US. I caught up with him on his UK tour to find out a bit more about the man behind the demons. Youâ€™re on a bit of a whistle stop tour of the UK at the moment. Howâ€™s it going so far? Professionally and personally, the tour has been fantastic. The Daylight War hit #3 on the London Times list, and every stop has had a bookstore filled with readers excited to chat about the books. I love the sight of a full bookstore, and it’s been fantastic to meet many of the people I interact with on social media in the flesh. It’s an odd phenomenon to have so many people I talk to all the time but only know as some avatar and not a person. It’s great to match names and faces to the icons and cybersnark. Logisitcally, the tour has been more of a challenge. We’ve squeezed in two stops a day, but British Rail seems to have it in for me, leaving us running from place to place, arriving breathless and sweeping out right after the last book is signed. Exciting, but exhausting, too. I was three hours late to my signing in Milton Keynes, though I was able to get the word out about the delay quickly thanks to twitter, and almost all the readers simply went to lunch and came back. I was expecting a crowd with torches and pitchforks when I finally arrived, and was incredibly touched instead to find a cheery crowd happy to see me instead. Fans have been showing you pictures of their Demon Cycle tattoos, artwork and so on. How does it feel to be confronted with fandom like that? Amazing, gratifying, and a little frightening. I put a lot of pressure on myself to be worthy of my readers, but they are a pretty incredible bunch, and it ent easy. The Daylight War is out and doing well having hit number three on the Sunday Times Bestsellers list at the weekend. For those who havenâ€™t read it can you tell us a little bit about book threeâ€™s focus. The second book, The Desert Spear, focuses on Ahmann Jardir, who seemed an antagonist in the first book. Having claimed the title of Deliverer of the tribes of the Krasian Desert, Jardir invades Arlen’s homeland to conquer its people and levy them into all-out war against demonkind. Going back in time to Jardir’s childhood, the book tells the story of his rise to power by dint of his own courage and strength, but also the machinations of his wife, Inevera, a mysterious woman part seer and part Lady Macbeth. The book as a whole is an exploration of the other, and how when put in perspective, Jardir believes himself to beâ€”and perhaps isâ€”every much a hero and savior as Arlen. How does the series so far compare to what you originally envisaged? In terms of plot, things are right on target, as the individual character arcs drive the larger meta-story of the series forward at the pace I planned. But I have grown and changed as a person and as a writer in the fifteen years since I first started work on it, and that has been reflected in the story in ways I had not anticipated. The series and characters have grown in complexity as my own experiences have broadened. Whatâ€™s next for the Demon Cycle? Book four, The Skull Throne, is plotted in full. I have about 150 pages of stepsheet to begin layering prose over, which will be my primary focus once the tour is over. I hope to finish this book quicker than the last, but am reluctant to give a date for it until I get close to an endpoint. How do you balance writing with social networking and the other aspects of your life? Any set routine? As an active parent of a four year old and full time writer, ever day is a little different. Balancing parenting, writing, social media, and the vast clerical, production, and marketing aspects of my career remains something of a work in progress. Early in my career I set a high bar for social interaction with readers online, but as the books grow in popularity, I am being forced to scale back on that, lest it take up my every waking moment. Still, I try to be as accessible as I can, particularly on twitter, where interaction is truncated by design. I steal quiet time to write when I can, sometimes during the day while my daughter is at preschool, but mostly at night, when the dinging of my inbox slows and the house is quiet. How much has your success changed your life and your outlook? The day to day of my life has changed drastically since I became self-employed, but I don’t know that my outlook is all that different. 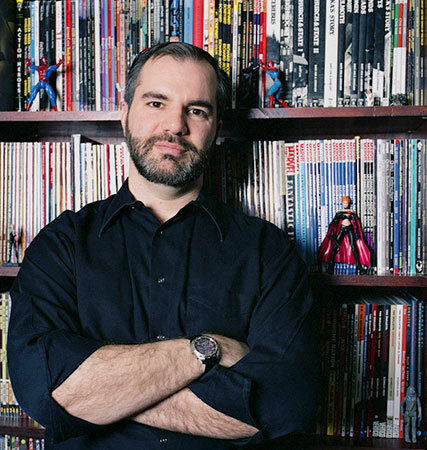 My priorities are the same as they’ve always been, And the success of the series has only increased the pressure to continue delivering my very best work to the readers who have made it possible. There was a great little book trailer produced for The Daylight War. How much input do you have into things like that? Quite a lot, actually. This time around, at least. With each successive book my input has increased with marketing elements, which is great. I have a background in PR, marketing, and print production, and these are all elements I like to work with my publishers on to help ensure that things stay on brand and that we deliver the highest quality materials possible to our audiences. Also out at the moment is Red Sonja. Can you tell us a bit about that project and how you got involved in it? Red Sonja was created as a spin-off book from The Chronicles of Conan, a Marvel comic book series produced primarily in the 70â€™s and 80â€™s. I was a big comics fan back then, and read both books, along with dozens if not hundreds of others. But while most of the other books I read were about superheroes, Conan and Sonja were fantasy, which was ever where my heart lay. Sonja is best known as the quintessential warrior woman in a chainmail bikini, which is how she got her start, but in the 80’s, the creative team of Louise Simonson and Mary Wilshire reimagined the character, placing her in a blue fur tunic more reminiscent of the fur loincloth often associated with Conan. That was the series that first introduced me to the character, and I was a big fan up until the book was cancelled due around issue 13. The property then languished for over a decade before Dynamite Comics picked it up and with writer Michael Avon Oeming and artist Mel Rubi, breathed new life into the character, returning her to her iconic metal swimwear and producing a high quality book. I met the team from Dynamite Comics at Book Expo America, and while discussing graphic novels and comics in general with President Nick Barrucci, I apparently really impressed him with my knowledge of Sonja and her history. A week later he quite unexpectedly offered me the chance to write a short run on the series. I agreed, but proposed doing something a little different, having a wardrobe malfunction force Sonja to doff her steel bikini and don the skin of a blue-furred demon, recreating the character as I most fondly remembered her. This story was released as the 36 page one-shot Red Sonja: Blue, illustrated by the amazing Walter Geovani. After the success of that book, Dynamite allowed me to continue the story. Red Sonja: Unchained is a four issue limited series that picks up where Blue left off (though they can be read independently). 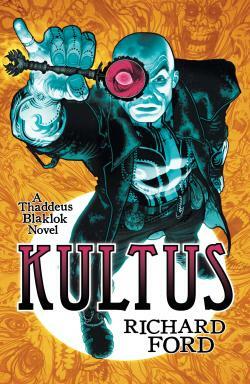 It is illustrated by the great Jack Jadson, with covers by Walter Geovani and Mel Rubi. The first issue is on sale now. Any plans for a Demon Cycle graphic novel, and if so how much creative input would you retain? There have been talks about it. I retain the rights at the moment, so I can license the project if I choose, but I don’t know that I trust anyone other than me to write it, and I don’t want to take my focus off the novels for too long until the series is done. Comics are near and dear to me, so I don’t think I would license the work for graphic novels unless I retained some control, or had a creative team I really trusted. Going back to The Painted Man, some of the characters, Rojer particularly, were very young at the beginning. How much consideration did you give to the fact you were writing from childrenâ€™sâ€™ points of view and that you would then need to grow those children into adults? How difficult was that to manage? I gave it a great deal of consideration. Rojer begins at three years old, and fortunately, I knew a few children that age and could study a bit what they were and weren’t capable. Rojer was not able to be a very active participant at that age, but three year olds see everything, and understand more than we give them credit for, so he was perfect as a witness. Each of the characters in the first book is scarred, either physically or emotionally (in Rojerâ€™s case, both) by a demon encounter in their childhood. These encounters drive the protagonists’ lives onto new paths that lead them to challenge the status quo of their world. Have any of your characters been particularly challenging or awkward to write? All of them, at some point or other. Have you given any thought to the future beyond the Demon Cycle and what else you may want to work on? The beauty of the world I’ve created is that there is considerable room to continue telling stories there even after I bring the main series to a close. I have one standalone book planned already, using the characters from Arlen’s home town, Tibbet’s Brook. I have notes for some others as well, but it may be that after I finish out my contract I’ll want to do something totally new. We’ll see when the time comes. Thank you for taking the time to talk to us and we hope to see you back in the UK sometime. Enjoy the rest of the tour. Thank you so much! It was great talking to you.